Starting with this proud statement, I want to share with you the story of a young man stuck between two different cultures, two different mentalities, so close, yet so far from each other. In our society, especially for the younger generation, national identity is a fundamental value to grow up with. Now, try for a second to put yourself in the position of someone who doesn’t have a precise country to relate to, because in both the places to which he is linked, Europe and the Middle East, he is used to feel like a foreigner. Growing up in a small and closed-minded Italian town wasn’t easy for me. To begin, my name and surname aren’t common here, so even if you try your best to integrate into this western society, you’ll be regarded as a stranger, as the different one who’s not accepted. Customs such as not drinking alcohol and not hanging out with girls are seen as shameful and ignorant, in this place where the “traditional” is seen as being old and uncool; and if you differ from the social pattern, someone will take care of bringing you back to the homogenous life that follows the “normal” principles of this moral society. There will always be someone to destroy your dreams and push you to follow what they consider the right path. My dream would be a multiethnic society where all people are equal, regardless of gender, background or skin color.As a Palestinian who lives abroad, I have my personal mission: since I can’t contribute practically against the occupation of my people, I can, on the other hand, raise awareness for the cause in Europe, especially by talking to youth. The feedback I often get is very disappointing: people, upon hearing about these subjects, react selfishly, not showing any kind of empathy for the misfortunes of others. “Why should we care about someone else, whose problems don’t relate to us?”. The more I continue, the more I am convinced about the ignorance present in this kind of society. I’ve ended up realizing that probably it’s better this way: these kind of people aren’t the right ones to work for peace. I still think that the young people are the ones that can reach our final goal, peace: the goal that previous generations failed to achieve, because we are the hope, the real hope that can turn past the pages and begin another chapter, having learnt from our past mistakes. Martin Luther King said : “If you can’t fly then run, if you can’t run then walk, if you can’t walk then crawl, but whatever you do you have to keep moving forward”. And this is precisely what I’ll do, and what we all should do if we still believe in peace. 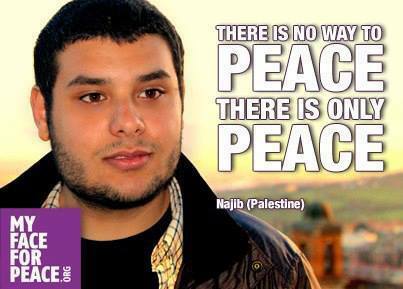 Peace, Salam, Shalom. Posted on May 12, 2013 April 10, 2016 by rebeccabrindzaPosted in English, UncategorizedTagged italy, NajibAlAsham, palestine, peace, salam, shalom, yalayoungleaders.